Daily Schedule | When Do I Go? What is When Do I Go? When Do I Go? uses class entry information to create time estimates for the following show day. When Do I Go? allows show managers to make effective decisions and adjustments the day before regarding the length of the following show day. 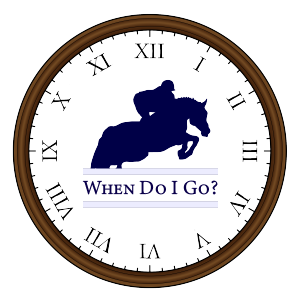 All requests by horse show management to use When Do I Go? time estimates are to be submitted at least 7 days before the start of the show. A signed contract must be received by When Do I Go? at least 48 hours before the start of the show. Multiple shows may be included in one annual contract. Any cancellation of When Do I Go? services must be received at least 48 hours before the start of the show, otherwise services will be billed in full and management will be responsible for payment of contracted services. Management to include an ad for When Do I Go? in prize list (if prize list has already been published, an exception may be made) and a link to When Do I Go? on their website. Ad and link info will be provided by 2nd Mouse Media. To encourage exhibitor participation in the accuracy of time estimates, a notice highlighting the 5:00 PM cutoff time is to be posted in the horse show office, at the in-gates, and in other relevant locations. A notice detailing this information will be provided by 2nd Mouse Media and emailed to the show secretary at start of the show or can be downloaded below. In order to provide time estimates that are as accurate as possible, please be aware of the following schedule. When Do I Go? reserves the right to not create time estimates if significant delays to this schedule occur. If no response is received by 7:45 PM, approval will be considered implied.